Forced to leave behind his wife and four children, Hafeezullah, a member of Pakistan’s ethnic Hazara minority, sought asylum in Australia, 10,000km from home. He settled in the small Limestone Coast town of Naracoorte and built a life “from nothing”, opening an Indian restaurant and harnessing a desire give back to the community that took him in. “In my country it’s not safe for Hazara men,” Hafeezullah says. “That’s why I came to Australia. It’s the best country in the world, and it’s a safe place. “I arrived in Australia, and my friend lived in Naracoorte, he told me to come here. I had no work, I was thinking I’d search for how I’m going to build up my life, so I arrived in Naracoorte. After settling in Australia for two years, Hafeezullah opened Pearl Indian Cuisine Naracoorte, and set out to give back to the community that had embraced him. Hafeezullah supplies Country Fire Service (CFS) volunteers with free meals and water during emergencies, and also trains and mentors local students and fellow migrants in the town. He supports Naracoorte High School and Independent Learning Centre students, who mostly speak English as a second language, to increase their employability and build their confidence. “Many students come through and go on to get a part time job,” Hafeezullah says. Aside from hosting fundraising dinners, Hafeezullah provides breakfast for Naracoorte’s annual Australia Day celebrations, and is a member of the local Rotary Club. In 2017, his story made it to TV screens across Australia when SBS World News aired a piece on his background and the restaurant. Hafeezullah’s brother Asmat Ullah Haidari has also settled in South Australia and for the first time since 2013, Hafeezullah will travel to Iran in July to see his wife and children. He says bringing them to Australia is too difficult due to immigration processes but he manages to stay in regular contact. Hafeezullah is a trained chef, having worked in Pakistan and Saudi Arabia. Naracoorte Migrant Resource Centre co-ordinator Jenny Stirling says about 350–400 Afghans and Pakistanis currently call Naracoorte home. She says people often detour to Naracoorte to enjoy fine dining at the Pearl Indian Cuisine Naracoorte. “His restaurant is noted for its excellence in service standards, quality of ingredients and standard of fare,” Jenny says. It’s hard to find a bad review of his Indian-style cuisine, which he cooks from authentic recipes and fresh spices and ingredients. “Indian (food) in Pakistan, the taste is the same – it’s a part of India and a part of Pakistan,” he says. “Butter chicken is a top dish for Indian cuisine and it’s my favourite. Pearl Indian Cuisine Naracoorte supports many local wineries including Brand’s Laira, Penley Estate, Patrick of Coonawarra, Browns of Padthaway, and DiGiorgio. 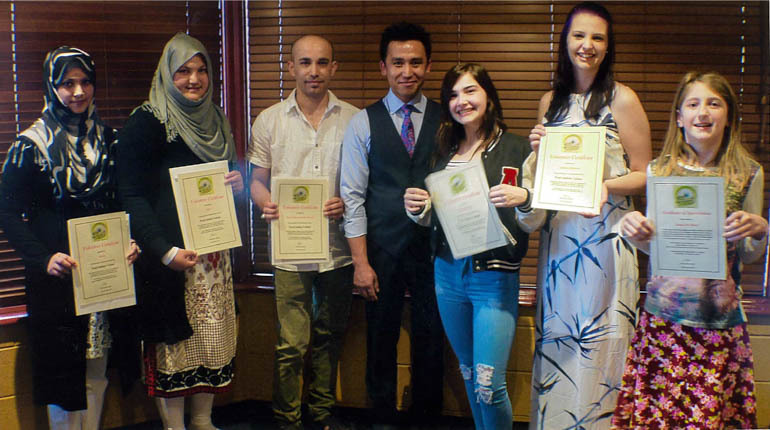 Photo by the Naracoorte Herald: Pearl Indian Cuisine Naracoorte volunteers, Fatima, left, Zahra, Sayed Kazimi, with owner Hafeezullah, and Kara Renshaw, Alannah Johnson and Lianni De Been congratulated on their efforts.